A young friend of mine, Zack Ulakovits, (who when I first met him many years ago was a crazy kid in my kid’s church, at the church where my wife and I were involved in children’s ministry,) gave this book to me, telling me that I would enjoy it. I have to say that I did…and I have to say that Zack, (who now attends college,) is one of the finest young men I have ever known. He even asked me to write a letter of reference for him, as he was entering college, which was a real honor for me. 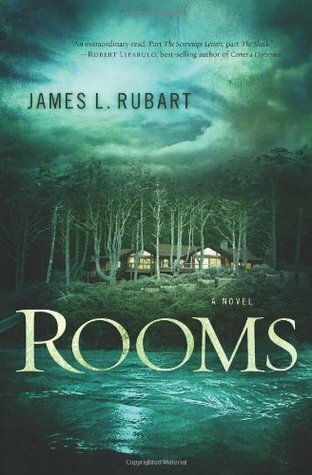 Anyway, when I began reading, “Rooms,” by James Rubart, I didn’t know what to expect. I was a little put off by the front cover “blurb” by Robert Liparulo, ” An extraordinary read, part, ‘The Screwtape Letters,’ part ‘The Shack,’” mainly because I am a huge C.S.Lewis fan, and thought that,” The Screwtape Letters,” was a work of genius, and that the “Shack,” was, in my opinion, one of the most diabolical warping of the Scriptures that had ever been penned. -Honestly, I didn’t know what to think. I am a big believer in “blurbs.” If I see a promotional comment by an author that I don’t like, I will often pass that book by…..but conversely, if the author is a favorite of mine, then I will more than likely pick it up. In this case, not wishing to disappoint my pal Zack, (and also knowing him and the fact that we shared the same taste in books by certain authors, such as Ted Dekker, and Frank Peretti), I went on his assessment. I was pleasantly surprised, as it did prove to be a pretty good read. Again, as I have mentioned before in other reviews, a little hard leaning on the Western Greek interpretation of the Scriptures (which was written intentionally to an Eastern Hebraic understanding), but recognizing this, I was able to look for what the author was trying to share through the life of Micah Taylor, the rich young software entrepreneur, and really enjoyed the journey of discovery that the hero of the story encounters. I am not going to say too much, because unlike my other posts which are usually on books that have been around for many years, I sure don’t want to spoil this one for anyone. The gist is that Micah, who has life by the tail, CEO of RimSoft, romantically involved with his beautiful business partner Julie, receives a letter of inheritance from his deceased great uncle Archie, (who was the uncle his dad had told him to stay away from.) His Uncle Archie had left him a home…in fact, actually had built him a home, at Cannon Beach, on the Oregon Coast, where Micah had spent youthful summers camping with his family twenty years prior. Simple enough….but what entails becomes a journey in which Micah will begin to realize who he really is, but even more importantly, who God is. Micah begins to understand that this is more than a house. It is the very floor-plan of his own… soul. Within it’s 375 pages, “Rooms,” published by the B&H Publishing Group, in April 2010, had me looking at my own life, and the priority that I place on things. Being a Pentecostal, it was not too unrealistic to our current understandings, and it in no way was anything but honoring to the Lord. The author, James L. Rubart does have his own interpretations of how he views what it means to be a Christian. I can sure appreciate them, but he does tend to make it a little too easy, like it’s the cure for all of the problems we face in life. But I enjoyed it none-the-less, and have much respect for the author. I mentioned earlier in this review, the Western Greek mind vs. the Eastern Hebraic way of thinking. I am sure no expert, but I really feel that we have a responsibility to “renew” our minds to understand this more. Please know that I am struggling my way through this as well. The Bible was originally written to middle eastern people in a nomadic lifestyle, and often we try to read it as if it were written to twentieth century urban dwellers. We apply definitions to words in ways that they may not have been intended, and as a result built our beliefs on possibly errors in interpretation. We are also a people that want to know, “what’s beyond the horizon,” and applaud one another other for “scaling the wall.” The Hebraic mind, on the other hand, doesn’t place so much empasis on those things which cannot seen, and tends to focus on dealing with that which is at hand. They look forward to the past for answers, the westerner looks to the future. I really don’t know which is right or which is better, or even if there is truth in both. One think that I do know, however, is that “Rooms,” by James L. Rubart is a very enjoyable book. I think you will like it, whatever your bend, Pentecostal or otherwise. Thank you Zack Ulakovits!!!! Your reading taste has proven again, impeccable my friend, and I know you are going to do mighty things in our Lord’s Kingdom in the years ahead!!!! This entry was posted in fiction and tagged christian fiction, fantasy. Bookmark the permalink.